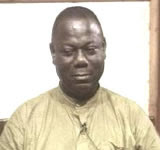 Mr. George Aggudey, is likely to miss the chance to contest for the flag bearer race of the Convention Peoples Party (CPP), as the 48 hour deadline for submitting his tax clearance certificate expires today Thursday December 6, 2007.Mr. Aggudey and two others, Accra based lawyer, Bright Akwetey and Dr. Kwaku Osafo were expected to submit their tax clearance certificates as requested by the party. To qualify to contest for the position to lead the party in the 2008 elections, candidates were required to submit their tax clearance certificates before the December 15, 2007 congress. The deadline for submission was however set on Thursday December 6, 2007.By the close of Thursday December 6, 2007, Mr. Aggudey was yet to submit his tax clearance certificate.Last Monday December 3, 2007, the party gave the three contestants 48 hours to submit personal documents to certify that they had fulfilled their tax obligations. In the case of Mr. Aggudey, who led the party in the 2004 elections, he is also expected to submit proof of payment of his employees’ Social Security contributions to dthe vetting committee.The other two, Mr. Akwetey and Dr. Osafo have submitted their tax clearance certificates.